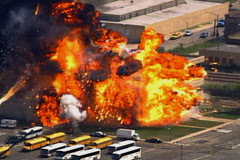 Dark Horizons has the link to footage of the massive explosion (not an accident btw.) for the new Batman movie. Living in Chicago during the filming of the two Batman movies has been VERY exciting. I can imagine! Good for you! !